Regiment Rhode Island on 13 Oct 1862. 26 Mar 1863 at Washington, DC. 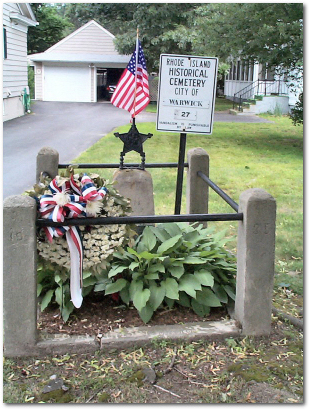 Thomas C. Matteson is buried alone on Inman Avenue in Warwick between the driveways of the St. Rose Church and rectory. On his enlistment papers, between his first and last names, there is an X with the words his mark. Thomas could not spell his name and had to rely on others to fill out forms for him. This being the reason for the variety of spellings of his last name on military records*. While serving in Company K, 12th Infantry Regiment Thomas was diagnosed with smallpox and discharged from the Union Army. A month later on April 24, 1863 he was dead. Out of fear of the dreaded pox, he was buried in a field owned by the Chafee family*. The 12th Rhode Island Infantry Regiment lost 2 officers and 46 enlisted men to disease during the Civil War.